In his latest chat with Gotham, nightlife impresario Omar Hernandez shares his secrets to cultivating a following, hosting the ultimate party, and how not to commit the gravest of sins—being boring. I was excited to hear that the Upper East Side was finally getting a little jolt of downtown nightlife when I read in the Times that you'd be opening a space in Vaucluse. Tell me how the spot differs in its latest form at Vaucluse. OMAR HERNANDEZ: The beauty of it is that both spaces exist even though they are contradictory opposites, for example, dark and light and young and old, feminine and masculine; it's a bit of the yin and yang, in a mysterious way they complement each other. I read recently that you were obsessed with Diana Vreeland, how did she and others influence the spirit of what you were trying to create at Omar at Vaucluse? OH: As Diana once said, “There’s only one very good life and that’s the life you know you want and you make it yourself." What's the key to cultivating a following the way you did? OH: The most important is to treat everyone you meet equally and sincerely make them feel special. Also I believe it is something intrinsic of my personality, some combination of curiosity, self-confidence, sociability, and energy. Once you know enough people across the social, cultural, professional, and economic circles, and make a habit of introducing people who work or live in different circles, in time something magical happens when trust kicks in and loyalty becomes your social currency. Are there people in nightlife that intrigue you? Who are some up-and-coming people to keep an eye on? OH: Yes. 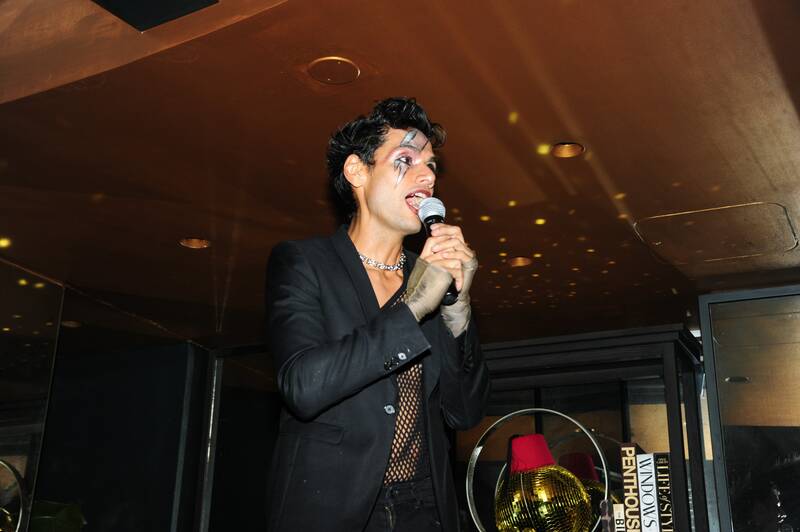 I am always intrigued by people in New York City nightlife that have transcended the so-called Golden Age (Susanne Bartsch, DJ Nicky Siano, Joey Arias, Amanda Lapore, and Ian Schrager, among others) and keep doing their craft and preserving this feeling of what nightlife could/should feel like. I am a bit cautious on the word up-and-coming since we live in an Age of Impermanence. I must definitely keep an eye on the newly appointed first ever NYC Nightlife Mayor Ariel Palitz. What's missing from the NYC nightlife scene? OH: Late-night in NYC has been bleeding for quite some time now. It's only dinners and random raves. It's time to take back our nocturnal habits, go deeper into it, and slowly bring back dancing as our only salvation. What are your tips for throwing the perfect party? OH: It all starts with who is hosting the party, in my case a perfect party is a revelry. It's like alchemy, when you plan for a party and you give the proper unmixed attention to the details you internally are trying to model from, that clarity that seems almost reverential is the single most important requisite for a party to have any chance to excel and transform itself into a revelry. Then you put all the material component ( lighting, food, music, decor) and somehow they come together exquisitely to render an experience that seems beyond measure. This may sound esoteric but when it works it's amazing. Nowadays you can find any tips for a perfect party one click away but the stuff I am referring to is intangible, the sauce that makes the perfect recipe. What's the secret to not committing the gravest of sins (being boring)? OH: Learn to differentiate the banal (so lacking in originality as to be obvious and boring) and wonder (a feeling of surprise mingled with admiration, caused by something beautiful, unexpected, unfamiliar, or inexplicable). Step on the edge of your comfort zone where wonder exists. Become an awe (a feeling of reverential respect mixed with fear or wonder) junkie (a person with a compulsive habit or obsessive dependency on something). What's the best party you've been to in the past year? OH: Hard to tell but if I must think of the one that made the final cut, it would be would be our bi-weekly party on Sunday at Omar at Vaucluse, a night that I feel has really been ignored by the NYC nightlife industry. I think of Sundaze as a tea dance for grownups, a respite from the mundane. Some other favorite moments included Tomorrowland's electronic music festival this past summer in Belgium and dancing to DJ Paul Kalkbrenner. Sadly, the parties I missed this past year were The Pineapple Motel Submarine Party at Burning Man and The Ondalinda Festival in Mexico. Where can we catch you hanging out when you're not at Omar at Vaucluse? OH: Hiking or climbing a mountain somewhere.